The best way to see current pictures and available kids is via our farm's facebook page. We have been breeding Nigerians for 15 years and generally have flashy kids with awesome pedigrees, show and milking backgrounds that also make great pets. All our does tested negative for Brucella abort, CAE, and CL...we have never had an abcess in our herd. In line with permanent identification, and the scrapie program, I don't like to see that gawdy tag in a little Nigie ear, and from a health standpoint, the potential of it getting caught and ripping out, so we even register our wethers. Our goats are fed 2nd cutting hay, a bit of goat grain, BOSS, and loose mineral supplements. They are innoculated annually with a CD/T vaccine, BO-SE and for parasites 3x/yr. Kids are given BO-SE, 2 CD/T boosters, and one parasite dose before leaving. They are dis-budded, tatooed, and registration paperwork is provided. They are healthy when they leave, and we can't be held responsible for what they come in contact with after they have left the farm. We reserve the right to modify pricing based on kid quality at the time of kidding. Blue-eyed kids or bottle kids, add $25.00 to cost. Kids are sold at weaning, about 8wks of age. Holding a kid for pickup beyond 8wks will enact a boarding fee of $1.00/day. We accept names for a pre-freshen waiting list, w/o a deposit, selection on first come/serve basis. Once kids are here, A $50.00 non-refundable deposit holds a specific kid. 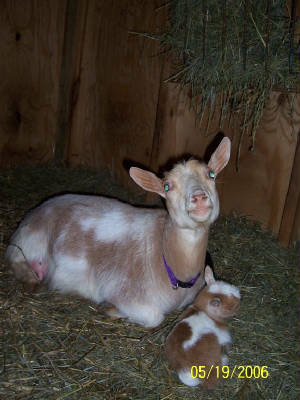 Our goats are registered with American Goat Society and qualify for ADGA.